Many SMBs don’t have a reliable data backup and recovery solution in place. Research has shown that only 23% of businesses back up their data on a daily basis. Not only that, only 50% of companies with disaster recovery plans have solutions for network outages and data loss. SMBs suffer an average of six computer outages a year. Downtime caused by a data-loss disaster costs SMBs approximately $12,500 per day. SMBs that can’t resume operations within 10 days of a natural disaster usually fail. With Allen Business Machines’ Forward Looking Technology solution, you can keep your business in business. We’ll help ensure that you can recover your billing records, customer lists and other critical data if a fire or some other disaster damages your systems. Our SAS70 Type II and HIPAA-compliant data centers store and protect your company’s information remotely. We back up your data every 15 minutes, every day. Also, you’ll be able to recover deleted emails from days or even months ago if the need arises. We’ll apply patches to maintain and update your systems. You can fix vulnerabilities and improve performance with no effort. 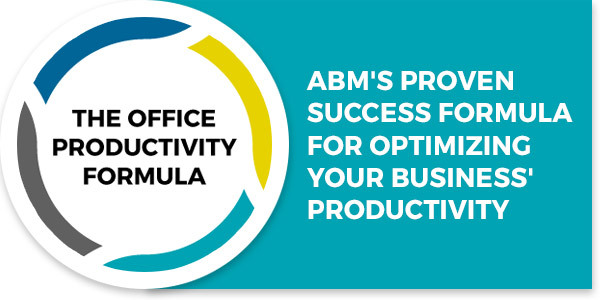 If your systems go down, ABM’s own system can take over as a virtual server. You can resume operations quickly while we work to resolve your network issues.